As well as selling cars, Arthur Daley drove his fair share too. 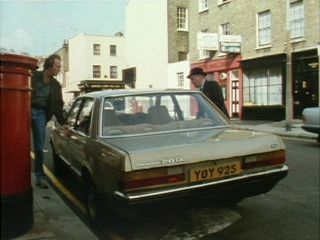 This page features the cars driven by Arthur Daley throughout Minder. For information on Terry's Capri, visit Terry's Capri Page. 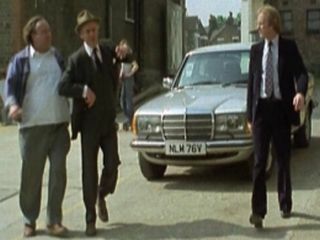 During the preparation of Brian Hawkins's book The Phenomenon that was Minder, author Brian Hawkins asked George Cole about the cars of Minder. George Cole mentioned that over the years he became a dedicated Jaguar enthusiast. The following information, not included in the book, has been included here with the kind permission of both Brian Hawkins and George Cole. George Cole said: “We always had a production base in London – it was a different one each series. I would leave home at 5:30 in the morning and drive to the base and a driver would take me on to the location. For the first few series’ I used to drive an old Ford Capri (not the one in the opening credits). 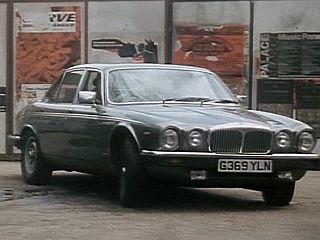 When we got to the end of the fourth or fifth series I was talking to the location manager about the Minder Jag and he said, ‘You ought to put in a bid to the company to buy it.’ I thought about it for a while and said, ‘Why not.’ So I put in a bid and it was accepted. 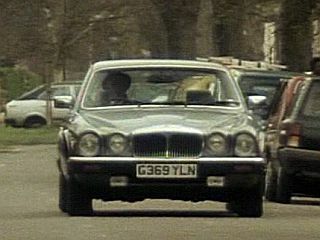 A couple of days later the TV Times phoned me and asked if it was true that I had bought the Minder Jag. I said that it was and they said they wanted it as a prize in a competition. I said, ‘I'm sorry but I want it.’ A few days later they came back to me and said, ‘If we can get Jaguar to make you an offer you can’t refuse on a brand new Jag would you let us have the old one back.’ I said, ‘Of course’ and Jaguar made me a good offer. I’m on to something like my seventh or eighth new Jag now. Currently I’ve got an X Type. It's a bit shorter than all the others and it’s the first one I’ve been able to get into my garage!”. 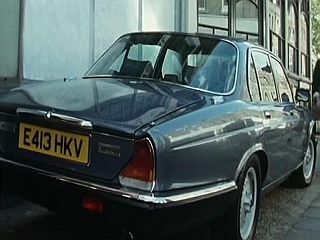 The first Jaguar that Arthur drove was a Silver Series II Jaguar XJ6 and featured throughout both series 1, 2 and briefly in certain episodes of series 3. 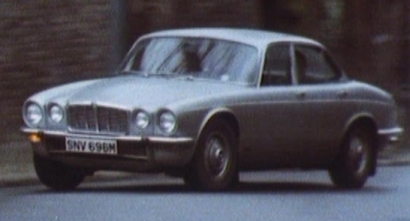 Pictures of the car also feature in both the opening titles and the closing credits. This shot here is taken from series #3.7 The Birdman of Wormwood Scrubs. 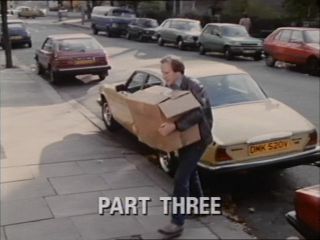 In series 3, this car only appeared #3.2 You Need Hands, #3.7 Birdman of Wormwood Scrubs and #3.8 The Son Also Rises which also happen to be the only episodes that feature Terry's original white SLE 71R Capri or we don't see Terry with his own car. This could perhaps suggest that certain episodes in series 3 were filmed at different times. Unconfirmed reports say this car has been auctioned off since the series, but its current location is unknown if it still exists at all. If you have any further information on its whereabouts feel free to contact us. 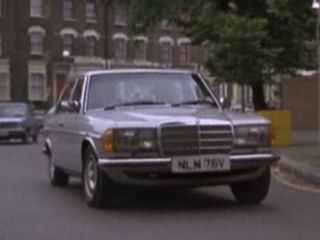 In series 3, Arthur temporarily dropped his Jaguar for a silver Mercedes 280 SE. 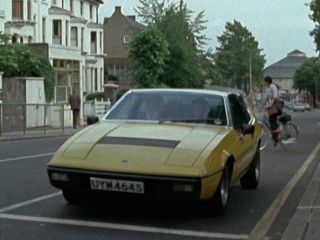 This car can be seen in five episodes #3.3 Rembrandt Doesn't Live Here Anymore, #3.5 Dreamhouse, #3.9 Why Pay Tax, #3.12 Back In Good Old England and #3.13 In. The shot on the left is taken from #3.3 Rembrandt Doesn't Live Here Anymore and the shot on the right is taken from #3.5 Dreamhouse. 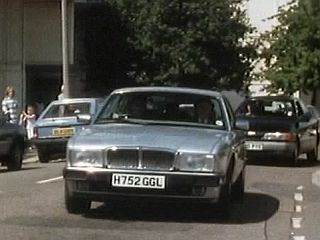 Between series 4 and series 6 Arthur drove a yellow Daimler Sovereign 4.2 Series III (with its distinctive fluted grille and bootlid plinth) which also featured in the #6.7 Minder On The Orient Express Christmas Special in 1985. The DYO 979V number plate is actually a prop plate. The car's real registration is VDU 342X. The shots shown here are taken from the 1984 Christmas Special #5.9 Around The Corner. This car was originally won in a TV Times competition in 1985 and later sold to a Mr John Maxfield. 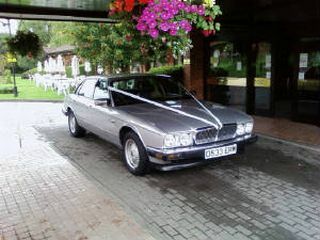 Mr Maxfield donated this car to Salisbury Hospice in 2002 for their summer raffle draw. The new winner of the car didn't want it and it was won on ebay in 2003 by fellow Minder fan Dez. Dez has kindly shared some photos of the car and these along with more details about the story of this car be found on Arthur's Yellow Daimler Page. 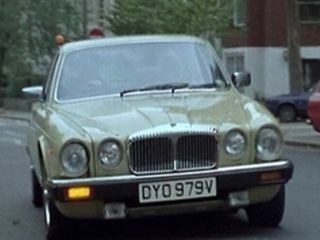 In the final Dennis Waterman series of Minder, Arthur's car had changed again - this time to a silver XJ6. This very smart looking car was acquired by fellow Minder fan Mark H in February 2005 after passing through various people's hands over the years. In July 2007, the car was fully restored back on the road for the first time in many years for site owner jno for his wedding in July 2007 (the shot on the right). Mark H has his very own website about the car and the on-going restoration project that led to it being roadworthy once again - all this and more here. Well worth a visit! Congratulations & many thanks to Mark H for all his hard work and dedication! 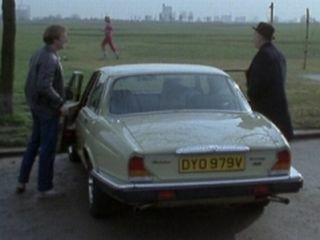 In the first Ray Daley series, Arthur was now seen in a blue Daimler Double Six, first seen in #8.1 The Loneliness Of The Long Distance Entrepreneur. 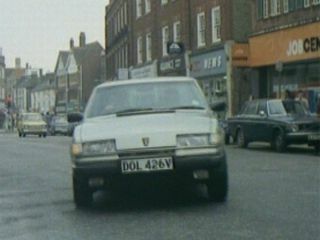 As no DVLA records exist for this car, it is likely that the number plate is prop - however, the plates E412HKV is registered to a brown Daimler and E414HKV to a red Jaguar Sovereign. 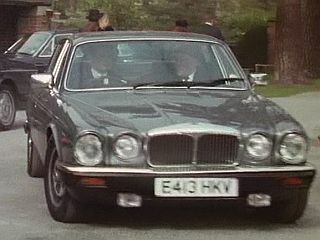 In series 9, Arthur has a different Daimler Double Six. Again, no DVLA records exist for this car. Although it looks similar to the series 8 car, a different colour interior confirms it is a different car. 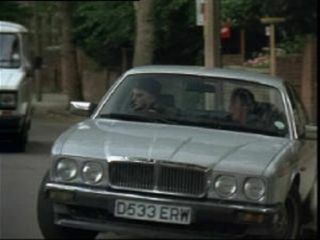 In series 10, Arthur drove a silver Jaguar Sovereign. According to DVLA, this number plate was registered to red Ford Sapphire until 2002 so it is likely that this is again a prop number plate. 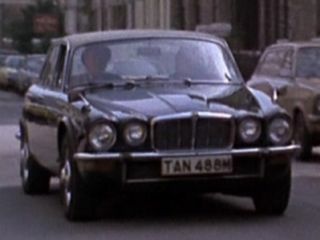 However, in the penultimate episode #10.9 Bring Me The Head Of Arthur Daley the character of Phelan changes the plates from a similar Jaguar Sovereign, registration K487 YWK - this plate was real and was registered to a silver Jaguar. Arthur takes ownership of this car for 24 hours in #1.6 Aces High And Sometimes Very Low. This car was seen in #2.5 Don't Tell Them Willie Boy Was Here and #2.8 A Nice Little Wine - the latter mentioning Arthur is testing it. This car was seen in #3.1 Dead Men Do Tell Tales and briefly in	#3.4 Looking For Micky. 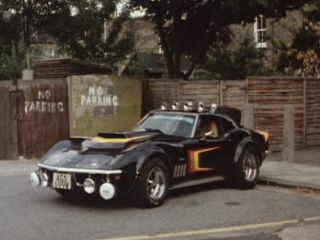 This car appeared in #3.10 Broken Arrow where Arthur acquires it in order to re-sell it. After Arthur parks it on an estate, it is vandalised by kids. 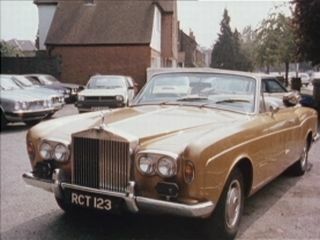 This car appeared in episode #4.3 Senior Citizen Caine - Arthur gives Cecil's son (Keith Barron) a 'modest down payment' for the car as he dreams of owning it. This car appeared for a few seconds in the 1986 anti-drugs special #6.8 A Little Bit Of Give & Take. 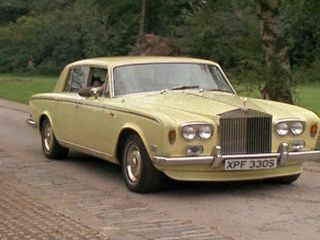 It is likely the usual Yellow Daimler was no longer available. 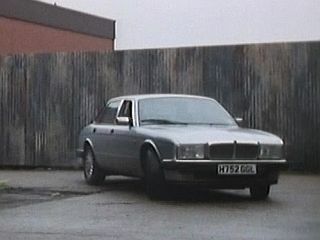 This car appeared in the 1988 Christmas Special #7.0 An Officer & A Car Salesman. This car appeared in the #7.1 It's A Sorry Lorry Morrie - Arthur is driving this solely because he is down on his luck. If you have any further information about any of these cars, or have any extra details you would like to add to this page please feel free to contact us.